Anita’s store at 5666 La Jolla Boulevard is flanked by restaurants, clothing boutiques, coffeehouses, juice bars, exercise studios, and other specialty stores. “I’ve always loved the friendly atmosphere of this unique business district,” Anita says. Wood bought the business on February 21, 1987. “I knew I wanted to work for myself, so when the opportunity came along, I jumped on it. 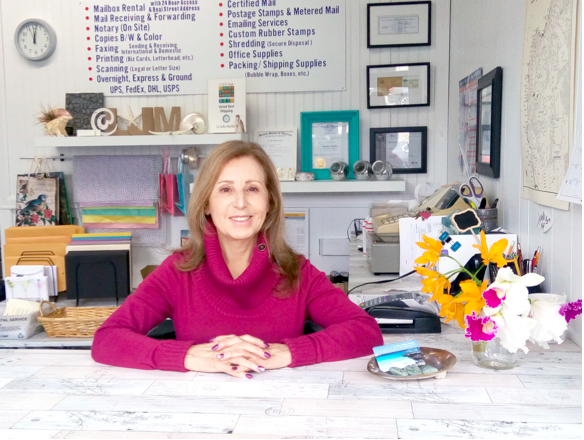 My only regret was not doing it sooner.” The services offered by the previous owner were stamps (no postage metering), UPS, mailbox rentals, and “word processing.” Anita expanded her offerings over the years to include shipping of all sorts, scanning, printing, copying, and a notary public. 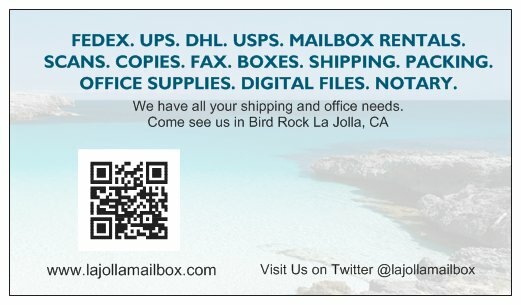 La Jolla Mailbox Rentals is the oldest business on the 5600 block. The future of the store? “I look forward to serving this wonderful neighborhood for many more years,” Anita says with a smile.